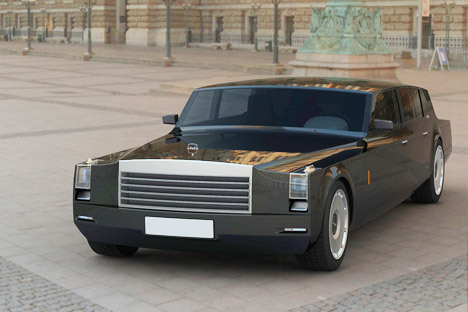 A ZIL-4112P prototype, with a 7.7 litre engine and six-speed automatic transmission, was unveiled to federal television channels on Sunday just months after Putin ordered government departments to seek appropriately patriotic, domestic alternatives to the mostly German foreign brands he and other top government officials have become accustomed to being driven around in. “We tried to preserve the generic feature of the ZiL: the recognizable style, the lighting, the mirrors. We wanted it to be clear that this is a ZiL, not a soapbox, not a Mercedes. If you look, its dark blue. If you look at what Obama drives around in its a scary submarine, no kind of aesthetic, it's awful to look at,” ZiL's Director of Limousine Production Mikhail Sattarov told Channel 1. Soviet nostalgia has not sacrificed modern comforts, however. The interior features leather seats, worktables, and the pride of the ZiL: a big screen hooked up to an external video camera that allows passengers to see where they are going even with the curtains drawn. It also boasts specialist security features — “know-how that no-one else has,” according to Sattarov — to guarantee the safety of both driver and passenger. Fuel consumption has also been improved to 25 litres per 100 kilometres. The late Communist Party chief Leonid Brezhnev's limo was said to guzzle a fearsome 65 litres.